President Abraham Lincoln had recently signed the act of Congress creating the Medal of Honor. Secretary of War William Stanton personally awarded the first medals. On September 16, 1863, it was received by Willie Johnston, He was 13 years old and only 5 feet tall. He had enlisted in the army at the age of 11, and was awarded the highest medal for his bravery during the Peninsula Campaign when he was 12. Most of us have been shocked by the documentation of Child Soldiers with modern automatic weapons fighting in some of the most bitter and brutal wars on our planet. The notion that children, who by the legal and ethical standards of our society, could not be held responsible for a crime because of their immaturity, are put in a situation of killing hundreds of fellow humans and making all the moral and ethical decisions we expect soldiers in war to make is very had to digest. People are shocked, and also ask how did this happen? What can be done to prevent it? However, the photographs below give us a historical picture that is surprising to many of us. 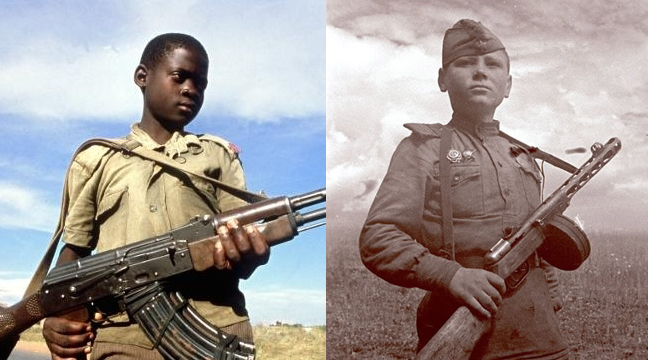 The left hand child soldier is typical of what we have seen in the Western media for a few years now. The Lord’s Resistance Army of Uganda was prototypical of large parts of Africa, Asia, and some of the Arab nations of the Middle East. The picture to the right–the other young b oy with the latest automatic weapon of the time was a Russian boy who fought Germany in WWII. However an inquiry into the history of child soldiers provides us with a reality that most of us do not welcome. Child soldiers have been the norm throughout history and have been accepted in almost all societies until relatively recently. So many of American norms and perceptions of war have been formed by World War I and II, that we tend to perceive our behavior in these wars as normal and other wars as aberrant. Perhaps, it was those wars that were the unusual ones and the others more typical. During the two World Wars, the United States had formal age requirements for military service. There were instances where these regulations were evaded by youngsters lying about their age, but these were not very frequent. The American armed forces in the two World Wars was composed of young men, 17 and over with a strong representation of middle-aged men 30-40, This however was not the case for our other nations. These German children were captured soldiers who had been fighting fiercely. The Germans equipped an entire SS Panzer Tank Division and manned it with 16 and 17-year-old boys from the Hitler Youth brigades. As Germany suffered more casualties, more teenagers volunteered and were accepted, initially as reserve troops but then as regulars. The German ethic of the boy soldier not only encouraged such service but towards the end of the war, the Germans even drafted boys as young as 12 into military service. 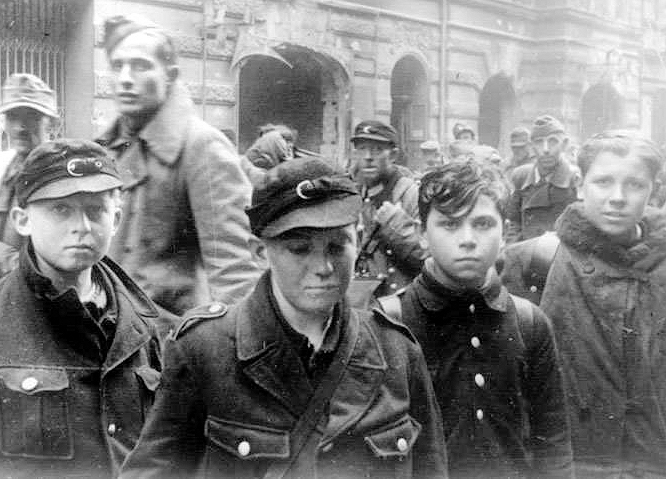 These children saw extensive action and were among the fiercest and effective German defenders in the Battle of Berlin. American older teens and especially American men were horrified as they fought and killed–and sometimes were killed–by boys who were barely old enough to graduate from elementary school. Most of the soldiers opposing the German Child Soldiers were Russians. That Russian invading army had many boy soldiers. The brutal German invasion of Russia killed 22 million Russians. Many of the boy soldiers had not only been orphaned but had seen their own parents killed, Many wanted vengeance; others had nothing else to do; others were excited, as young males have been, by the “glory: of war. 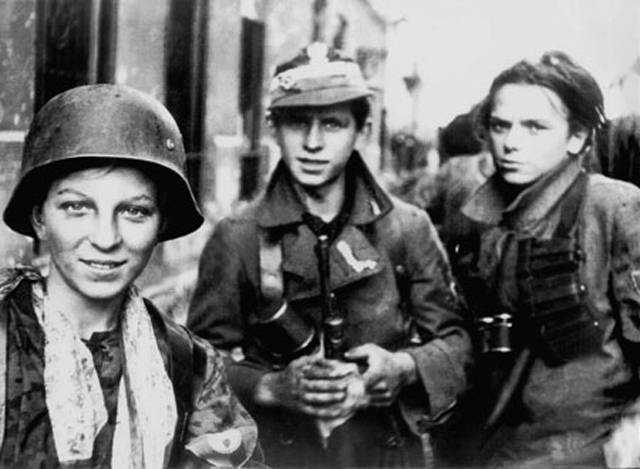 Polish young boys played an important part in the WWII Warsaw Uprising. These boys' facial expression could be the same as before a soccer game. Many child soldiers enjoy their service. Polish boys fought the Germans as well. For many of them it was kill or be killed, but others were motivated by patriotism or excitement. The Europeans were not the only militaries which used boy soldiers in WWII. The Japanese made extensive use of boy soldiers when their losses started mounting. Many young boys volunteered to be Kamikaze suicide pilots. Many of the kamikaze pilots believed their death would pay the debt they owed and show the love they had for their families, friends, and emperor. The Chinese fighting against them also used boys. The photo below is a classic of a 10-year-old boy soldier fighting against the Japanese as part of the Nationalist Chinese Forces. Most Asian armies used young boys throughout history. Recently, the Tamil Tigers terrorist revolutionaries Sri Lanka used boys. sometimes volunteers and sometimes forced, not only as soldiers but also as suicide bombers, It was the Tamil Tigers that who were the models for the Palestinian and other Arab terrorist’s using boys (and girls) as suicide bombers and of course, it was the young children that the terrorists sent against the Israeli mature soldiers in the Indefadas. Israeli Prime Minister Golda Meir famously told Anwar Sadat of Egypt, “We can forgive you for killing our sons. But we will never forgive you for making us kill yours.” Using boys was a very effective tactic against the Israelis as those mature soldiers were very reluctant to and never did use their major weapons against the children although many were killed even with rubber bullets tear gas grenades. 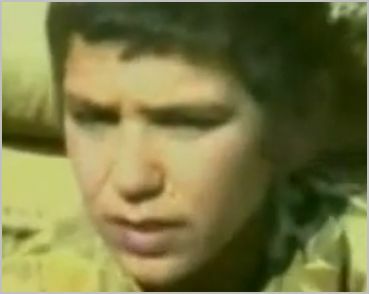 14 year-old Iranian soldier. He as killed in battle shortly after this picture was taken. In the Iran-Iraq war, Iraq brutally invaded Iran. Both sides used boy soldiers. Iran, to clear minefields for the more mature soldiers to advance, actually send young boys in waves to “martyr” themselves. In many attacks waves of young children and women were sent in advance of the regular troops. The Iraqis however, did not have the reluctance of the Israelis to use heavy weapons against the unarmed children. Machine guns, artillery, hand grenades, and rockets mowed the women and children down but used up ammunition. The Ancient Roman Army would not knowingly allow boys under 16 to enlist in the army. They had military and philosophical reasons for this. The Roman soldiers were not just fighters, but each was also a specialized technician. A blacksmith, carpenter, concrete specialist, hunter, physician, cook, engineer, etc. The Roman Army required mature men, educated in the technologies of the times. However almost all the other armies of the ancient world included male children. However before them, the Greeks used child soldiers. The Spartans started military training at age 7 and from then on boys were soldiers. In Jewish law and tradition, boys of 13 go through the Bar Mitzvah ceremony. Even today, 13 year old Jewish boys recite the famous statement, “Today I am a man!” King David started his career as a shepherd and then joined King Saul as a boy soldier which he was serving as when he killed Goliath. The ritual is just that, and in Israel today, children are not allowed to serve in the Defense Forces. However there is a strong ancient tradition in modern memory. The Ottoman Turkish Empire made extensive use of child soldiers who were drafted from all over the empire to form the Sultan’s Personal Elite Corps. Initially, the children selected were all Christians and Jews. The theory was that they would be the personal slaves of the Sultan. Islamic law prohibited enslaving a fellow Moslem, hence only the heathens were brought to Istanbul for training. They were called the Jannisary Corps and they not only became the elite fighting forces of the empire but they became the managers and administrators for the Sultan’s empire. The non-Moslems would, it was thought, not be so easy to assist the Sultan’s rivals as they were not related to any by blood or tribe. Later, Moslems were included in the first military and administrative meritocracy outside of Asia. However, young boys were always the recruits and they grew up as Jannisaries. Theoretically, induction was at 14 but there is much documentation of children as young as 8 entering the Corps. Christianity not only maintained the practice of child soldiers but took it to a new extreme. 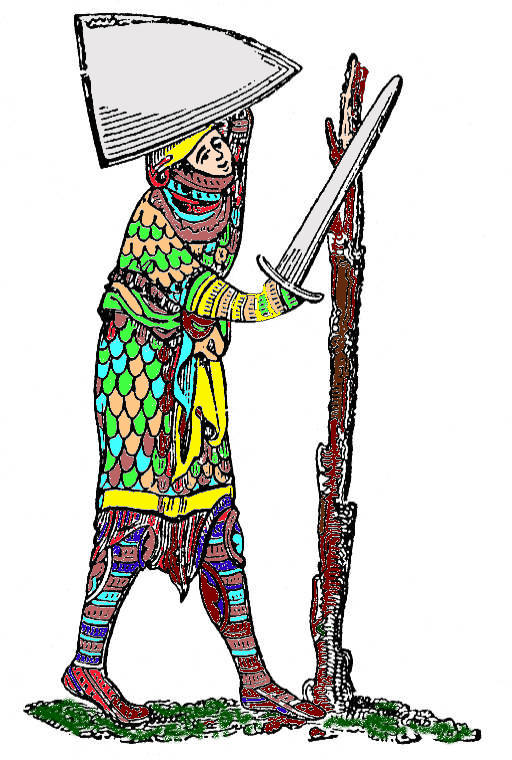 Almost every knight had young boys in service as squires and other staff. There is an unverified tale of a “Children’s Crusade” where European Children went to the Holy Land to fight for Christ. In Africa boys had traditionally been used as soldiers but Shaka, the great Zulu warrior king, organized the practice. At the age of 6, boys joined Shaka’s army as apprentice soldiers. Initially they carried spare weapons and did other chores but as their skills developed they took their places as regular soldiers whenever they merited promotion. President George W. Bush in 2007 signed into law the Child Soldiers Accountability Act. The law was approved unanimously by both houses of the U.S. Congress, and makes it a federal crime to recruit or use soldiers under the age of 15 — anyplace in the world. Any American or foreigner who has recruited child soldiers anywhere in the world are subject to United States justice. Many other countries have similar laws. The problem still lies in enforcement. Probably the most terrible use of child soldiers was made by the Khmer Rouge of Cambodia in the late 1970’s. They used child soldiers, both boys and girls, Their genocide executed about 1 million people, but perhaps the worst thing about their crimes was the fact that they used children as executioners, often of their own parents as well as others the adults decided were not fit to live. Despite the solid documentation of these crimes against humanity, it took over 25 years for anyone to be tried in Cambodia and then it was just a few middle level functionaries. Khmer Rouge Cambodians had traveled to the United States, Europe, Asia–virtually every continent and yet no country has yet seen fit to bring any to justice. When Hezbollah sends children out as suicide bombers, the world is preoccupied with whether the attacks on innocent civilians are justified, and the fact that children have been convinced by their elders to blow themselves to bits to achieve some political objectves of the adults gets lost. In Uganda and neighboring countries, the world knows where the thousands of abducted children of both genders now serving in the Lord’s Resistance Army are. Yet the crime has not produced sufficient outrage in any country so that the nation will send law enforcement and military forces to free the children and stop the crimes. Human progress is unfortunately often very slow. We can only speculate how many more children will suffer before world public opinion can be translated into law enforcement and military action. There is some progress however. 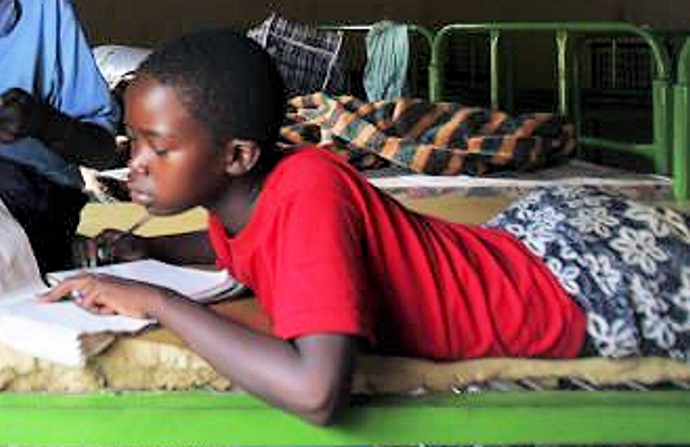 The picture below shows a young Ugandan boy enjoying his newly developed skill of reading. At his young age however, he is a already a seasoned military veteran and victim of kidnapping when he was much younger. He was freed and is in the process of being rehabilitated. Would that there could be more like him. Entry filed under: History, Politics. Tags: Abraham Lincoln, Africa, Ancient Greece, Ancient Rome, Anwar Sedat, Arabs, Cambodia, child soldiers, Child Soldiers Accountability Act, children, Children's Crusade, China, China. Warsaw uprising, Christianity, Civil War, Congress, Elisha Stockwell, George W. Bush, Germany, Golda Meor, Hezbollah, international law, Iran, Iran0Iraq War, Iraq, Israel, Jannisary Corps, Japan, Judiasm, Khmer Rouge, knights, Lord's Resistance Army, Medal of Honor, military service, Palestinians, Poland, Russia, Shaka, Shiloh, soldiers, Sparta, squires, Sri Lanka, suicide bombers, Tamil Tigers, teenagers, terrorists, Turkey, Uganda, war crimes, William Stanton, World War I, World War II, Zukus. Thanks for the compliment and the criticism. I was asked to release this article quickly and as you observed I did so without proper proof reading. However as I write this an editor is working on it. Sorry for any inconvenience. Philosophically we are devoted to the inforamtion first and gramattical asthetics are second. Unlike classical publishing, the beauty about cyberspace is that we can publish, get the immediate utility of the inforamtion out, and then catch up with the niceties of spelling and grammar. However, for those who are offended by this approach, I apologize. I think this is lastest solution of invaded countries. Hi, thank you for your very informative article. I would like to find out more about the historical accounts of the military use of child soldiers and I would like to ask you if you could give me some bibliographical references you used in order to find out more. Thanks a lot! I have written some of this and there are over 70 references with which you can start. Good luck and contact me if I can help you further. So, if everybody else threw their children into the fires of Morlock, you’d do that too? I find it interesting that of all the countries in the world, only Israel and the US, the only two truly moral countries in the world, only those two value their children as more than cannon fodder. I certainly do not approve of use of child soldiers. It is simply a fact that many countries including the US in the past has used them. Remember in Ancient Israel a 13 year old was considered then an ADULT. Governments who use children to fight in wars are criminals. Poor bloody wanes have enough suffering and terror to go through witnessing the horrors of war with out being forced to become soldiers. Taking away the innocence of childhood. Shame on yous. They are all our children to be loved and cherished. Not all Muslim countries do that, i haven’t even heard of a Muslim country do that. Hi Omar, do you read the paper or listen to the news? You must be living under a rug! True. Not all Moslem countries use child soldiers. Most do not. But some do. The worst recent case was Iran using tens of thousands of young boys to go ahead of the regular soldiers into mined and heavily armed areas during the Iran-Iraw War. Today, the problem is greatest (Moslem and non Moslem) with non state militias and armies where the practice is still common. Hi. my master thesis is about child soldiers in Iran-Iraq war. I have seen your exact comment “Iran using tens of thousands of young boys to go ahead of the regular soldiers into mined and heavily armed areas” like a copy paste in different websites. YES there were child soldiers in that war. but going to the war was a will of their own. it was wrong that the society allowed that to happen, but there was no obligation, no miss use. in fact because of the culture of the martyrdom and patriotism they were heroes in their society. You are right literally, but where I think you miss the point is that there is no society where youngsters cannot be intellectually and emotionally coerced to do anything. In almost all modern societies youngsters cannot even make a contract to buy a TV set, much less agree to risking their own lives and limbs on a battlefield. The fact that it is voluntary makes no difference when it comes to children or others not mature enough to make any kind of mature, reasoned, choice. Your point that Christians used 15 year olds (and even younger) is correct, but that was 600 years ago. Christians used the worst kinds of torture then, but no Christian church condones it today. Iran used youngsters as martyrs years ago, and that was in keeping with the moral standards of the day. Unfortunately, Iran and some other Islamic societies — not all by any means — function with the most moral and modern thinking of 600 years ago. Today it is immoral, criminal and not even allowable in most modern Islamic theology circles. The nation wants respect, but this abuse of children is never to be respected by civilized people in my judgment. but when did it start? Did anyone try to stop it before it got more intense? I would love to see some references being mentioned here. I like this text but it is not something scientific and reliable that I can use it in my paper. also you have used some irrelevant facts to make irrelevant conclusions. like because the knights used children in their army groups so the issue of child soldiers exists in Christianity??!!! Actually, this particular occurrence of the Medal of Honor has been conformed by the Department of Defense which has records of EVERY Medal of Honor. You should go there and go through their archives. The comparison of Christianity is not unimportant in my view lest some readers get the idea that Islam is unique in this moral failing. But the more important reason for including it is that the article is historical showing that use of child soldiers in not a new phenomenon. Re the references, there are several embedded in the text and captions, but I did not have the time or inclination to track down the primary sources, Had I done so, I would have published in a Professional Peer-Reviewed Journal and not just in a blog. Unfortunately, no one else seems to have either. However, if you are doing your thesis on the subject, why don’t you add some. Send them in a comment and I will be happy to edit the article and add them. I am doing a research paper on child soldiers, I would like to use this information. I need to do a works cited page, however I am not sure if this is a scholarly journal, just a regular web page or an article can you please help me out with that scriptamus? This is a scholarly blog. So it would be a journal but it is not peer reviewed. I am the editor and have approved or written all of the articles. Feel free to cite or quote from the article. Good luck. Funny you talked about the middle ages, you got to inderstand that cutting a man to pieces takes more than shooting a gun, pages and squires were often raped as part of their training, it’s evil but it does make killers. its very useful for my assignment.thank you! We are glad to be of help. That is what Scriptamus is for. Tell your teacher about it please.